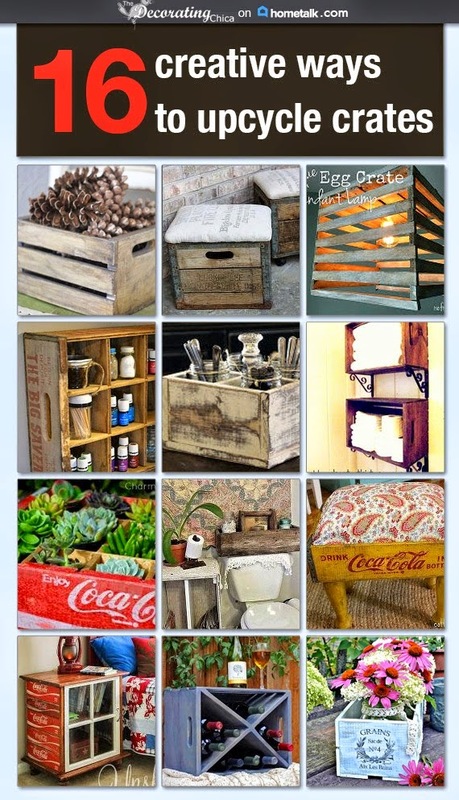 The Decorating Chica: It's fun to be a copycat! It's fun to be a copycat! 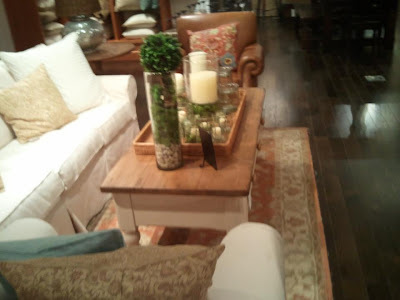 When I saw this table at Pottery Barn, I fell in. love. Quick photo taken with my phone that was hidden under my shirt!! Well I certainly wasn't expecting to ever have my own Pottery Barn table like this, way out of my budget for sure. But, little did I know that one day...my hubby would come home with a BIG surprise. 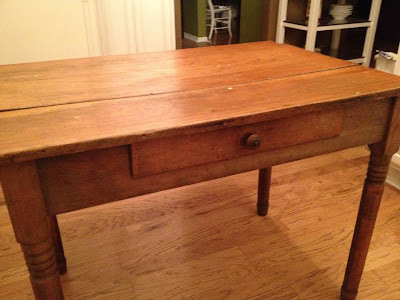 He found a cool old desk on the curb as he was dropping our kids off. The funniest part? He drove all the way home to describe it to me and ask if I wanted it. Really? Was that even necessary? Bless his heart, he drove back to get it and it was still there, looking a bit worse for the wear but oh, the character! It actually sat in the middle of my kitchen for a couple of weeks and I was seriously tempted to keep it there. Never thought I really had room for a kitchen island but loved the extra counter space. But, it was a bit too short. So, I looked at it, and thought, looked at it, and thought and decided it would make a great coffee table. Time to get busy! Chop go part of the legs, took the top off and started painting. My hubby cut off about 2 inches down the side of the table top where there was a big gash, I sanded them and mixed a little leftover brown paint with clear glaze and water. Then, I simply painted the top with my mixture, let it set a minute, and wiped it back. Really let's the woodgrain show through! Painted the base of the table top with Heirloom White spray paint. Beautiful color! Love the rustic charm, even has a little warp in the tabletop. Very cool! Love how it turned out ~ so clever!! A curbside find? Wow, I need to drive around your neighborhood. It looks awesome and that uneven top just gives it more character. Great job. What a great transformation of your curbside table. I looked around you blog and love what you've done. I am now following you on both Linky and GFC. Thanks for stopping by my blog and your sweet comment. That looks fantastic! Great rescue!! Very nice. I love that idea of cutting off the legs. I will now check all the roadside tables I come to. Found you through Power of Paint! You did a great job on this.